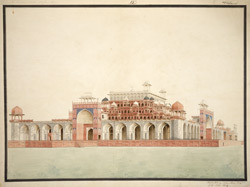 Watercolour by Latif (fl..1820s) of a corner view of the Mausoleum of Akbar at Sikandra in Uttar Pradesh, dated 1820-22. The image is inscribed on the front in English: 'Tomb of the Emperor Akbar at Secundra'; and in Persian characters: 'Sikandrah: raudah i Akbar badshah 'amal i Latif' (Sikandra: Mausoleum of the Emperor Akbar. The work of Latif). Akbar (r.1556-1605) was an energetic and innovative ruler who succeeded in being a significant unifying force in India. Dated inscriptions show that the tomb was completed by Akbar's son Jahangir (r.1605-27) in 1614. It is set in a vast square garden of the 'chahar bagh' plan, a formal garden divided into quarters by red sandstone causeways containing water channels, interspersed with fountains and ponds. The main entrance is on the south and ornamental false gateways on the other three sides lend symmetry. The monumental main gateway, in a hybrid style of Persian and Hindu elements, is of red sandstone with inlaid and mosaic patterns of floral and geometric shapes. It has four white marble minarets at the corners of its roof divided into three storeys by balconies and topped with domed pavilions. The north and south faces of the gate have recessed arches within the rectangular frame and inscription bands around the entrance. The tomb itself is a five-storey structure. The ground-level storey of the mausoleum itself comprises a set of arched recesses with a high recessed arch or 'pishtaq' at the centre of each of the four facades topped by a marble kiosk. The upper storeys are trabeate in construction with a marble screen at the top. The cenotaph sits on the top, fifth storey which is open to the sky, exactly above the grave in the chamber below. It is inscribed with the ninety-nine names of Allah and intricate floral motifs.